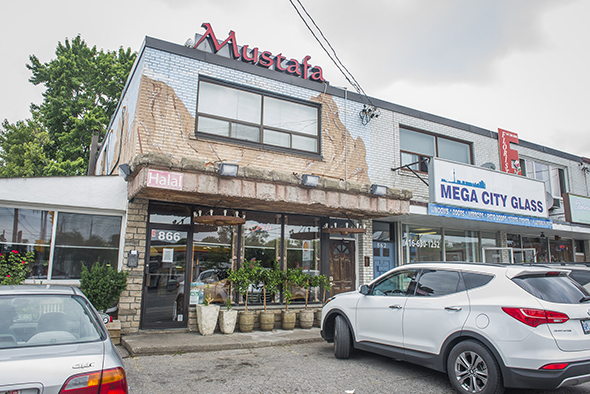 Mustafa is THE place to get Turkish pizza in North York, perhaps Toronto. 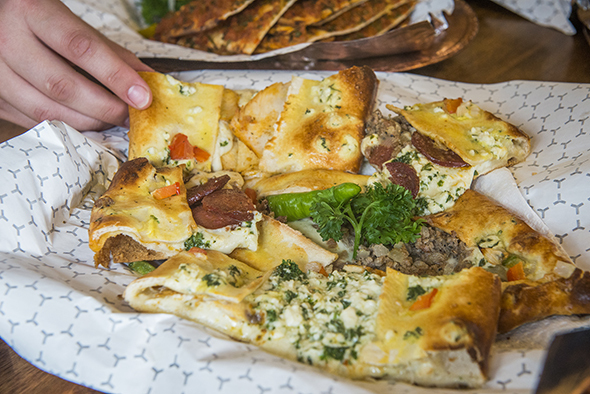 Turkish pizza, or pide (pronounced pee-deh) as it's more traditionally known, is a long, flat, boat-like bread stuffed with cheese and other toppings. 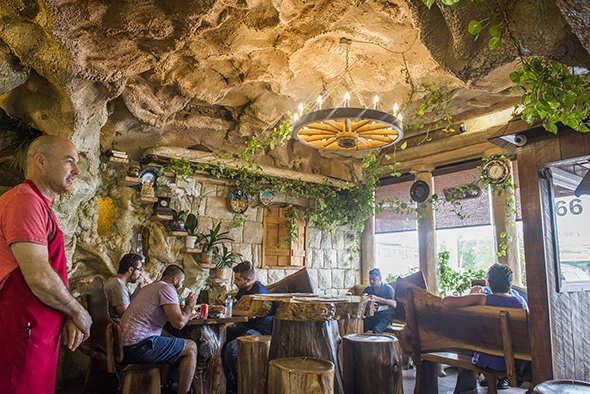 Located on Wilson Avenue in one of North York's many fine strip malls, the interior of this restaurant is designed to look like a cave in Turkey. Look way up for the sign, because it's on top of the roof, so you might miss it otherwise. The decor, complete with fake vines, is a little like that of Nazareth . Gigantic, sturdy wooden benches are either made from whole tree trunks or just look like they are. Turkish tea always comes first, served in traditional itty-bitty glasses. 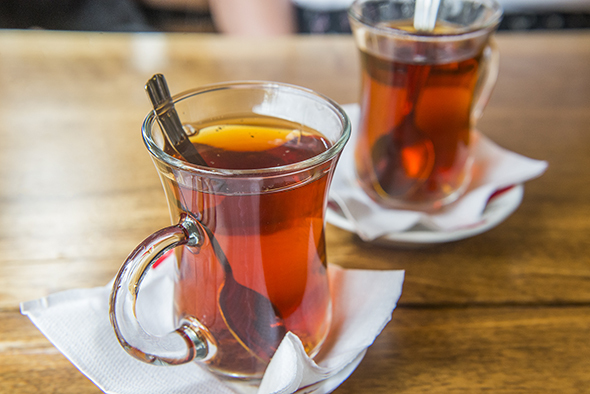 Spicy, aromatic, and bitter without a healthy dose of sugar, Turkish tea anywhere is a life experience not to be missed. It's the perfect complement to potent, spicy flavours. We try Iskender, named for the 19th-century Turk who invented it. This dish is long, flat strips of meat ladled with sauce and served with a heaping helping of plain yogurt. It's served with a metal covering, so when the Iskender is presented clouds of steam billow above the meat. Under all this tomato-y sauce and yogurt are mouth-watering chunks of authentically made bread. You can get a whole loaf with your meal if you wish, to soak up all the meaty goodness. We also try the Iskender plain with rice on the side, and it's possible to order the meat in a wrap, a little like shawarma or gyros. 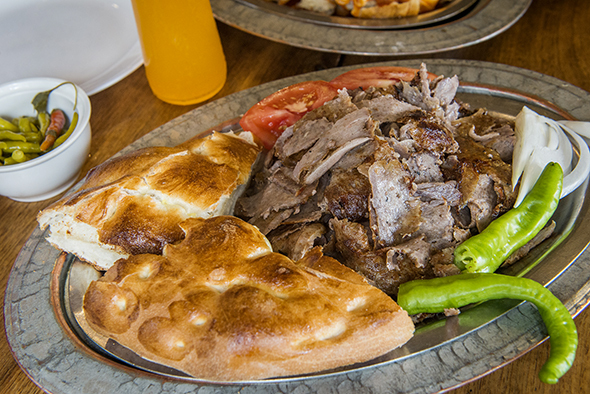 It's hard to say whether this or the Turkish pizza is the main event: both are popular dishes. The most popular dish, however, is a more plain Turkish pizza topped with mildly spiced ground beef, as well as familiar tomatoes, onions, peppers, and herbs. The dough is thin and not folded over like most pide, but cut into big flat slices and served in a basket. We also try the assorted pizza, which combines many of the toppings available: and yes, if you were wondering, you can get a pepperoni Turkish pizza. Last but not least Mustafa serves beautiful Turkish desserts. 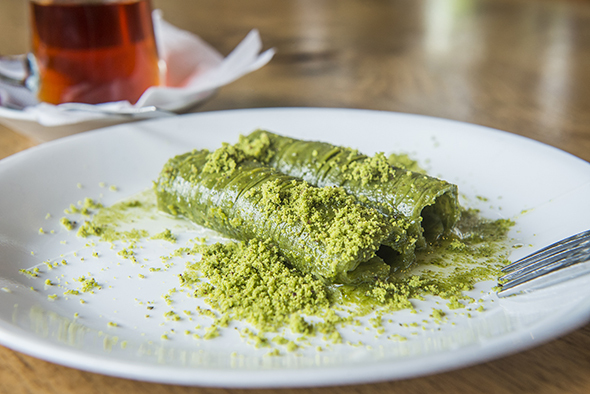 We try sarma, a cylindrical pistachio pastry that's a bit like baklava. Mustafa is well-known and popular, with many customers excitedly rushing in and out picking up take-out orders. 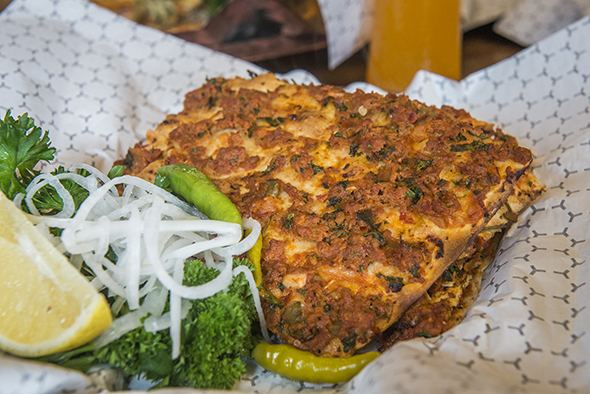 If you haven't tried the sensation known as Turkish pizza yet, Mustafa in North York might just be the best place to do it.